ProtonMedia: Virtual reality better than actual reality? If you've ever had the good fortune to travel to some of the most awe-inspiring locations in the world, for instance, the Eiffel Tower, you'd probably say that looking at pictures of the tower is nothing like being there, and experiencing its majesty, history, and vibe. The same goes for any experience, really. Listening to a Billy Idol CD is totally different than seeing him live. Meeting a business contact over the phone is nothing like meeting them in person, where you can make eye contact and shake hands. We've always thought that nothing compares to being there. Nothing is better than the real thing. Nothing is better than actual reality. Right? Wrong. What if we can make something better than being there? What if we can add functionality that doesn't exist in real life, but that makes the overall experience more valuable? 3-D virtual worlds are bringing this notion to light, and challenging the long-held assumption that nothing is better than being there. Of course this depends on how you define better. Some physical things just can't be duplicated in a virtual world. But there are ways 3-D virtual reality can be better than actual reality. For instance, it can cost you less to visit the Eiffel Tower in a 3-D world because you'll save on flights, a hotel, and meals. It can be better for the environment, because it saves fuel. A good enterprise example is the project we did with BP, in which the company held its Global Graduate Forum in ProtoSphere, instead of at a physical venue. 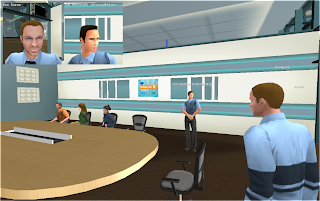 Our 3-D virtual world allowed its graduates to travel to uninhabitable territories at the far corners of the earth; interact and communicate with peers, corporate executives, scientists, politicians, and government officials alike; and make collaborative business decisions. BP determined it saved $3.7 million in travel and other logistical costs. When the event wrapped up, Joe Little, BP's Chief Technology Officer who headed up the project, said, "We took our annual graduate conference, an event that had always occurred in the real world, and found we could run the entire thing and achieve better outcomes without having to physically meet one another." If that's not testament to virtual reality being better than actual reality, I don't know what is. It really gets you thinking about the possibilities for 3-D virtual technology. It's been primarily used in gaming and entertainment, but it's also making clear inroads into the enterprise, helping companies become high-performance workplaces and speed collaborative decision-making. Labels: BP, Decision-making, High-performance workplace, ProtoSphere, Virtual reality, Why 3-D?